Despite begging UFC president Dana White to make his next title defense against that “punk” Alistair Overeem, Junior dos Santos (Pictured) will instead put his heavyweight hardware up for grabs against Cain Velasquez on December 29th. White confirmed the rematch following Saturday’s UFC 150 press conference. Dos Santos easily disposed of former two-time champ Frank Mir at UFC 146 to post his first successful title defense. 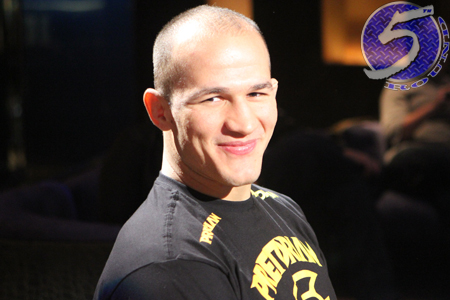 Prior to the 2ndRound TKO victory, dos Santos put Velasquez to sleep in just 64 seconds to capture the crown in November. The 27-year-old owns a 15-1 professional record and is perfect through his last 10 scraps. Velasquez was also victorious in the same Memorial Day weekend card. He destroyed Antonio “Bigfoot” Silva in the opening round of their one-sided shootout to earn his shot at redemption. The 265-pounders were supposed to rekindle their rivalry at UFC 152, but the sequel was scrapped for undisclosed reasons. Although White didn’t confirm a location, the UFC is notorious for hosting their New Year’s Eve weekend shows in Las Vegas. Therefore, either Mandalay Bay Events Center or the larger MGM Grand Garden Arena will host the bash.